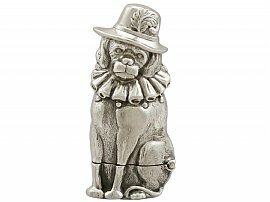 This fine antique Victorian sterling silver vesta case is realistically modelled in the form of a Punch's* dog, Toby. The surface of this Victorian vesta case is embellished with embossed and chased decoration reproducing the fine details of the dog's anatomical features and fur. 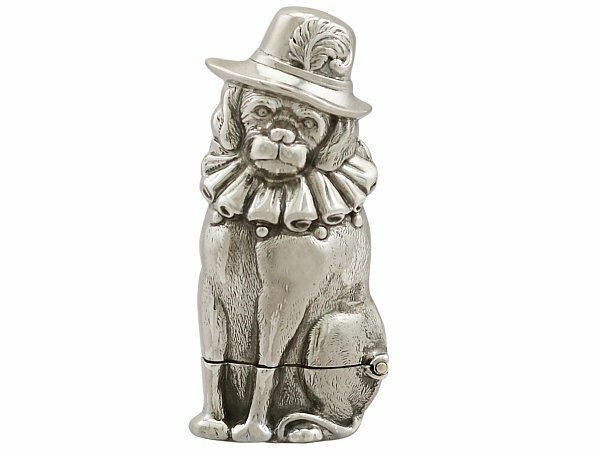 The canine character is dressed in a wide rimmed hat with a feather to the anterior surface, in addition to a jesters collar. The ornamentation to the novelty vesta case continues to the original shaped spring hinged cover. There is an integrated serrated panel/match striker to the underside of the hind quarters. * Mr Punch is a pertinent character in the traditional British seaside hand-puppet show Punch and Judy. Mr Pulcinella Punch and his wife Judy re-enact comical classic tales incorporating a wide range of 'guest' characters: the Constable, Joey the clown, the skeleton, Toby the dog etc. Many of these characters fall victim to the violent nature of Mr Punch's club. This antique Victorian vesta case is an exceptional gauge of silver, exceptional quality and in exceptional presentation condition. Full hallmarks struck to the sleeve of the body are all very clear. Reflections in photographs may detract from the true representation of this Victorian silverware.